A working meeting between government energy and transportation officials, the city mayor and Gazprom in Moscow has discussed the use of gas as a vehicle fuel in public transportation. The meeting discussed the benefits of using natural gas as a vehicle fuel and the plans for expanding the CNG filling infrastructure of Gazprom in Moscow and the city’s NGV fleet. Taking part in the meeting were Viktor Zubkov, Chairman of the Gazprom Board of Directors, Kirill Molodtsov, Deputy Minister of Energy of the Russian Federation, Maxim Liksutov, Deputy Mayor of Moscow, Head of the Moscow Department for Transport and Road Infrastructure Development, and Mikhail Likhachev, Director General of Gazprom Gazomotornoye Toplivo. 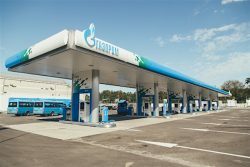 Currently, there is one active CNG station owned by the Gazprom Group in the area along the Moscow Ring Road. In November 2017, a new CNG station of Gazprom will be brought into operation on Moscow’s Levoberezhnaya Street (see above image). With the capacity of 29.8 million cubic meters of gas per year, it will be the most high-performance CNG station in Russia. Gazprom plans to complete the construction of another eight stations in 2018. In its turn, the Moscow Government will continue to purchase natural gas-fueled buses and municipal vehicles. Today, there are 155 gas-fueled buses in operation in Moscow. There are also plans to purchase 181 more passenger vehicles in the first half of 2018. Also next year, the requirements for rolling stock will be revised as part of the tender procedures for commercial operators in citywide passenger transportation. The revisions will help streamline the process of issuing permissions for more gas-fueled vehicles in Moscow. “Moscow, with its enormous passenger traffic, is one of today’s most promising NGV markets. In the coming years, the city’s automakers will be able to boost the economic efficiency of passenger transportation by converting vehicles to gas and cutting fuel expenses. Natural gas conversion will be beneficial to the environment as well. This is why we need to actively promote cooperation between Gazprom and the Moscow Government on the use of gas as a vehicle fuel,” said Viktor Zubkov. Gazprom and the Moscow Government signed the Agreement to promote the use of natural gas as a vehicle fuel. The document is aimed at developing and implementing investment projects for the construction of refueling infrastructure for passenger vehicles, as well as increasing the number of gas-powered buses in Moscow. There are currently nine active CNG filling stations in Moscow and the Moscow Region, eight if which are owned by Mosavtogaz.